Many of my friends know that I (and Chris DiBona and Mark Stone) have been working for a little more than a year on assembling a book of essays for O'Reilly on the evolution of Open Source. For me this book was a labor of love. I recruited most of the essays from outside North America because so few of us think about the worldwide impact of Open Source. This is important stuff! There are essays in the book on the situation in China, India, Europe, South America as well as several about the idea that Open Source principles can be applied to human endevour outside of technology. I'm hoping you'll find it interesting. Bring your copy along to the next O'Reilly conference you attend, and we'll be happy to autograph it (although its really our wonderful essayists whose autographs you should be seeking). Here's a picture of me holding a "still warm off the presses" copy in Amsterdam at EuroOSCON last week. The Open Source Initiative believes that the Open Source Definition can and should be applied equally to any license with a bearing on source code. We rely on a process of public debate on the License-Discuss mail list and only consider publicly submitted licenses for possible "OSI-Approved" status. It is not uncommon for organizations wishing to submit a license to contact the board for a conversation. Sometimes this happens before a license is submitted and sometimes it happens after there has been substantial public discussion about a given license. In all cases, the board strives to provide education about the OSD and the uniformity of process we follow. 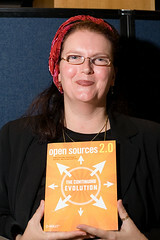 This year the OSI has focused on expanding awareness of Open Source by more purposefully serving the expanding international open source movement. To that end, we've expanded our board to include 4 members from outside North America. In this process, we realized that the OSI Website is a valuable resource for governments and others worldwide as they explore open source. In order to be a credible resource, we received strong and consistent feedback that focusing on the historical negative actions of a single company, especially a globally prominent company which has strong commercial positioning in every country, was not helpful. Furthermore, it was leading to the false impression that open source was all about muckraking instead of a viable, professional alternative to the traditional proprietary world of software. We voted unanimously as a board in April 2005 to move historical materials such as Eric Raymond's "the Halloween Documents" and Michael Tiemann's "A Case for Open Source" to the authors' sites for maintenance and to re-focus our efforts on increasing professionalism and credibility for both OSI and for open source worldwide. Re-focusing our efforts towards a positive future has been very successful. This year we've been invited to participate in South America, Asia and Europe at conferences and in private consultations with governments and local businesses that are contemplating open source licensing or policy issues. The OSI Approved brand is increasingly recognized outside the US. This puts OSI in a much better position to serve a growing constituency. After their announcement this week, Microsoft did meet with a quorum of the OSI Board and we discussed our commitment to equal application of the license approval process and gave them very preliminary feedback on the licenses as they appear on the MSDN website. So far, Microsoft's licenses have not yet been submitted to License-Discuss for public discusion, but OSI is hopeful that they will be. The big news today at EuroOSCON is the fact that Microsoft has posted new source licenses, and a couple of them might actually be OSD-compliant!! You can see the licenses here. They'll also be releasing some source today under these licenses. Jason Matusow announced the news in Amsterdam, and Steve Ballmer will also be talking today about them. The licenses have not yet been submitted to License-Discuss for review and possible OSI approval. Apparently Larry Lessig has reviewed them and says they're good. So, have we won yet? Well, let's review. The FOSS movement is supposed to be about establishing a level playing field. The OSD is supposed to set standards for characteristics of licenses that allow that level playing field to be set up. So "getting" FOSS licensing is an important first step. It's certainly a far day from 2002, when this article said Microsoft was going to start up an open source practice real soon now. But its something. Undeniably something. These are interesting times, no doubt about that...time will tell.